eMule Plus was achieved thanks to the extensive work from Aw3, BavarianSnail, bond006, DonGato, DropF, DrSiRiUs, EC, Eklmn, FoRcHa, katsyonak, kuchin, KuSh, morevit, netwolf, Purity, SyruS and TwoBottleMod and through all the collaboration of the people sending us code. We also thanks the dedication Cax2, Lord KiRon, moosetea, obaldin, reCDVst and zegzav gave to the project. We wish them the best of the luck in their lives. 22.12.2005 NEW! eMule Plus 1.1g released! 01.08.2005 NEW! eMule Plus 1.1f released! 12.07.2005 NEW! eMule Plus 1.1e released! 21.03.2005 NEW! 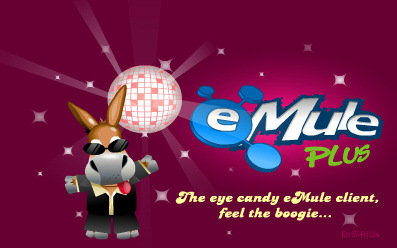 eMule Plus 1.1d released! 01.03.2005 NEW! eMule Plus 1.1c released! 27.12.2004 NEW! eMule Plus 1.1b released! 12.12.2004 NEW! eMule Plus 1.1a released! 22.10.2004 NEW! eMule Plus 1.1 released!